Danielle was born on the Cheyenne Reservation on near the Colorado/Wyoming border to William and Peg Moonstar. They owned a large horse ranch and unlike a majority of native americans weren't poverty stricken or living hand to mouth. As an only child she is doted on by both parents and grandparents. Things are pretty normal growing up for Danielle. Or as normal as they can be for a mutant manifesting the first of her abilities at such a young age. Meager though they were. From an early age she has a unusual affinity for animals, birds, lizards, etc. It was almost as if she could understand what they were saying and that they could understand her. Living on a ranch and on the Reservation her near gift is highly regarded by her tribe. Her grandfather, Black Eagle, is shaman to the tribe and begins to train her to be his successor. Tragedy strikes when Danielle is only 8. Her parents are killed in an automobile accident. This leaves Black Eagle to raise her. Danielle does not take the death of her parents well. She retreats into the wilderness to seek solace with the animals that live there. Her grandfather, understanding her grief, allows her this time, but to keep the young girl safe he begins to train her in wilderness survival skills, including the use of bow, rifle and knife, how to track, how to make shelter and forage for food. All those skills that thier native ancestors used for survival on a daily basis. Eventally Danielle recovered, but she still preferred her animal friends over human companionship. Especially when she began to experience fearful visions that she knew wasn’t hers and on occasion know when someone was going to die. Neither of these made her the most popular person in the tribe. Though most of the people remained friendly, at a distance. A few months after her 15th birthday Black Eagle, was visited by the late William's old friend, and blood-brother, which is a big deal in the native american culture, and invited Danielle to join his school in New York. Despite her grandfather's cajoling Danielle refused to go to Xavier's school. She didn’t want to go to any school where everyone's idea of a native american was some love-struck, singing princess put out by a multi-million dollar company. Soon after Danielle had a vision of her grandfather's death. And despite her attempts to prevent it, he died in her arms, his last wish that she go to Xavier's and learn how to control her powers. Whether she wanted to go willingly or not, Black Eagle had arranged it so she would have no choice, short of becoming a runaway. His Last Will set up Xavier as not only her legal guardian, but the trustee of the inheritance she would get upon turning 21. So off to Xavier's she went, but not happily. Her years at Xavier's was typical for a boarding school that teaches teenagers how to control their powers and fit into a non-powered society. She made good friends. Learned how to control and expand her abilities, and had a few adventures. Shortly before her graduation she was recruited for SHIELD Academy. Having no other prospects except the completely ordinary college experience, Danielle took the offer. SHIELD Academy was a challenge, one that Danielle was up for. During her training she was involved in an accident that resulted in the loss of an eye. Since the loss happened in the line of duty, SHIELD replaced the eye with a cybernetic implant. 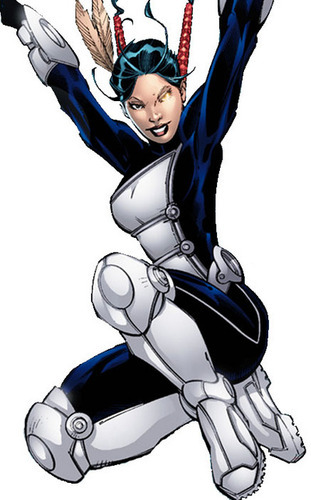 Between Xavier's (where she still technically resides) and SHIELD, she has found a home for herself where she is accepted and not looked at with fear or worry. She has since graduated from SHIELD Academy and is a full-fledged SHIELD Agent, albeit a junior one still going through field training and the like. Loyal - Danielle is a tried and true friend. She would never knowingly or willingly betray someone she cares about. In addition to being loyal to her friends and family she is protective of them as well. She will willingly but herself in harms way to keep a friend from getting hurt. Confident - Unlike a lot of mutants, both hero and villian, and a number of normal people too, Danielle was raised by her loving parents, then a doting grandfather. All three taught her self confidence. She was helped along this path by her training at Xavier's school and the relationships she has had with her team mates in SHIELD. Her confidence makes it hard for others to insult her being well aware of the fact that those that belittle others are only doing so to make themselves feel better. Morals - Danielle's morals pretty much point true north. She isn't one to break the law, though bending it to fit the needs to friends and family is doable if absolutely necessary. There are things she refuses to do, she won't kill a human being and she will only kill another living creature either for survival or out of mercy. She won't steal, unless it is called for by necessity, i.e taking something from a villain to keep him from harming others. Temper - Danielle can have a bit of a short temper about certain things, like hurting/insulting her friends, animal cruelty and she isn't very patient when it comes to bigotry and stupidity. Animal Person - Dogs, cats, horses, birds, rodents…there isn't an animal with four legs or two that Danielle doesn't like. She adores anything furry, feathery and some even scaly, and they tend to adore her right back. While she has nothing against the eating of animals or hunting for survival. She does take a stand against animal cruelty and hunting solely for sport. Goals - Her main goal is to get through senior agent training without loosing another eye or any other limbs. An eyepatch is nice, but only Fury can pull that one off. Motivations - What motivates Danielle is her sense of purpose. She has never been one to question why she was put on this earth. She has always known and been taught to be a steward to nature, to help others and to make a difference. It's why she joined SHIELD and what makes her a good agent. Illusions - Danielle's main power is the ability to create three dimensional illusions of someone's greatest fear. To the victim of her power this illusion is convincingly real, with all necessary sensory components to make them believe it. This power is effective on everyone but the most powerful of psychics. Prof X, Emma Frost and equally powerful mentalists would be unaffected by this power. Danielle is only able to use this ability on one person at a time. Psychic Arrows - Danielle's secondary ability is to manifest up to three psychic arrows at a time which she can fire with unerring accuracy. These arrows cause the victim's nervous system to overload or relive a traumatic experience from their lives. This power is effective on everyone but the most powerful of psychics. Prof X, Emma Frost and equally powerful mentalists would be unaffected by this power. She is able to fire three at a time and three different targets. Animal Empathy - This ability allows her to form strong bonds quickly with not only animals but also animal based shapeshifters when in animal forms, though shapeshifted humans tend to be harder to interpret since the human mind is much more complicated. The shapeshifter must be in animal form for this to work. The communication is limited to images and feelings, wants and needs. With a bit of concentration she is able to see through their eyes and hear through their ears. Using her animal empathy makes it easy for her to get animals to do things she wants or needs, though she would never knowingly abuse this ability. Death Sense -She can tell how and when someone is going to die, usually well in advance of their death, up to a week sometimes more others less. The person is surrounded by an aura that see can see. Danger Sense - Some people would call this a gut feeling or intuition. She frequently gets a foreboding feeling when something bad is going to happen to either her or someone that is close to her. It can start days before or just minutes before it happens. It's not as strong as Spider-Man's and is a more a nagging feeling. Cybernetics - After losing her right eye in a training incident it was since been replaced with a top of the line cybernetic model. It's the best SHIELD has to offer. The model includes, but is not limited to: Wifi w/connection to SHIELD database, heads up display, showing various info about surroundings and it SHIELD has info on who she is looking at, targeting, thermo vision, still pic and video capture and it glows a snazzy red on occasion. SHIELD - She is a trained Jr. Agent with the might of one of the largest global enforcement agencies at her back. If that isn't an advantage I don't know what is. Xavier - Uncle Charles, this is how she refers to him. Her father (William) and Charles were BFF's and blood brothers before the untimely death of William. That's a big deal and despite the fact that they have had rough patches he is still her Uncle and she can go to him for just about anything. Inheritance - When her parents and grandfather died she was left with a sizable inheritance, most of it in property, up to but not necessarily limited too, many acres in prime ranch land, a small herd of horses, a large house with the outbuildings necessary to running a ranch, etc. and a tidy sum of money that is invested in a variety of high yeild mutal funds and investments. The ranch is managed by the Cheyenne Reservation in her absence and most of the profits go to the Reservation itself, though she gets a small stipend to augment her SHIELD wages. Archery - Dani doesn't remember a time when she didn't know how to shoot a bow. She was that young when she started to train with it. Her skill is right on par with that of Hawkeye, though she tends not to use the trick arrows he does. Not to say that she hasn't on occasion, it just isn't the norm. Equestrian - Not only is she a skilled horseback rider, but with her animal empathy she is pretty much one with the horse she happens to be riding. She is skilled at mounted combat and can fire her bow with the same skill on a galloping horse as she can if she was standing still. Firearms - SHIELD trained, Dani is an accurate shot when it comes to the variety of firearms that SHIELD agents are trained to use. While she is better with a bow, she usually doesn't miss her target with a gun by more than an inch or two. Hopefully it isn't an inch that will count. Survival - She could survive by herself for weeks out in the woods when she was a teen, that part hasn't changed. Her SHIELD training has given her training to survive in more diverse terrains, but not for as long. Hand-to-Hand - Dani has always been a scraper. And after a few years in the 'tender' hands of SHIELD she is that much better. She could take on small group of mundane humans without a problem, even if they have similar skills. Through super-strength and other powers into the mix though and things could be dicey. Lacrosse - Dani enjoyed the sport as a kid. A lot of the children on the reservation played it for fun. She was surprised that they had a team at Xavier's, especially since it is a sport invented by the native americans centuries ago. She excelled at the game and was the female captain of the coed team. She still enjoys playing it once in awhile and it is a good way to keep in shape. Mental Clarity - Dani never got the hang of mental shielding, despite Xavier's efforts to teach her. What she did manage to learn was how to have a quiet mind, tricks to make it harder for a mentalist to read her mind or take it over. While this wouldn't stop most mentalists it does make their job harder and may give her enough time to stop them through more physical means. Espionage - SHIELD does have some covert op teams. Dani did do some cross training with one of those groups. She knows the basics of the spy game, but she certainly is no Black Widow. Native American Culture -Being a native american and being raised on the Rez by the shaman, Dani is well versed in the history, culture and mythos of her people, this includes being fluent in a variety to native american languages and dialects. Leadership - Danielle has a strong personality and has a way about her that inspires people to follow her lead. Several years in SHIELD has just accentuated that and gave her the other skills necessary to be a good leader. Power - Dani's powers have only been at full for a handful of years. In that time she has learned to control them under most circumstances. She has been known to lose it though. When she is under a lot of stress or experiencing a high level of fear or anger she can lose control and start projecting the fears of people around her. Enemies - As a SHIELD agent she has enemies those she has helped taken down and more of which she hasn't even met or know about yet. Defensive - Say anything or do anything you want to Danielle, but don't touch her friends. She is very protective of those she considers friends or team mates. She is like a mother protecting her cubs, she will undoubtly put herself at risk in order to keep them out of harm’s way. This not only can get her into stick situations with enemies but her friends as well since most of them are fully capable of taking care of themselves. Death Sight - Knowing when the people (or her beloved animals) around you are going to die and being able to see how it happens can be very traumatic. Especially if the way a person is going is particularly gruesome or tragic. She has had to learn how to filter some of that out, but she can't filter it all and sometimes it can be just too much for her.